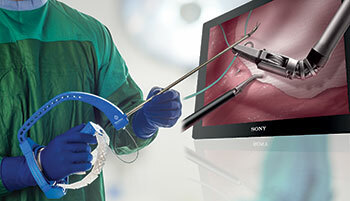 CENTER VALLEY, Pa., (April 8, 2019) – Olympus, a global technology leader in designing and delivering innovative solutions for medical and surgical procedures, among other core businesses, won Silver in the Medical category of the 2019 Edison Awards™ for the ENDOEYE FLEX 3D and FlexDex Needle Driver, developed by FlexDex, Inc. (3D/FlexDex). The distinguished awards, inspired by Thomas Edison's persistence and inventiveness, recognize innovation, creativity and ingenuity in the global economy. Olympus’ 3D imaging combined with FlexDex technology simplifies suturing in difficult-to-reach areas. The ENDOEYE FLEX 3D video laparoscope enables the natural 3D vision and depth perception of open surgery, while the FlexDex wristed needle driver precisely translates the surgeon’s hand, wrist and arm movements from outside the patient into corresponding movements of an end-effector inside the patient’s body. The 3D/FlexDex platform offers an alternative to high-cost robotics in minimal access surgery by providing the visualization and wristed instrumentation for suturing found in robotic technology, but at a fraction of the cost. Importantly, this technology can be used in any OR, at any time, on a laparoscopic platform already familiar to surgeons. 3D/FlexDex can be used during many types of procedures, including but not limited to general surgery, gynecological and urologic specialties.